I clicked on “How cheap are you” In Woodworking Skill Share Forum, as did 9 Others and I get this Warning. Anyone else get it, or is My Computer just Oversensitive? No Edit Available? I was gone for 4 minutes at the most. I checked this Topic out by going into it from Carloz Home Page and the other 9 Comments went through Okay. I guess I was the only one to get the Warning. Go Figure! EDIT: Now there’s an “Edit” available for another 23 minutes. I received the same warning 3-4 times last week. Made me a bit concerned that there had been a hack and dubious code inserted via photos, links et.al. The fact that it disappears may be a case of the web hosts protective systems mitigating the threat?? I had received it as well on Firefox. Haven’t gotten it again though. 3-4 times! WOW! That’s interesting! I wonder if the “Threat” really exists. Thanks for responding Oakhill. Maybe I’ll GOOGLE that website and see what they have to say, or NOT! Maybe “Management” on here knows what it means. I am not showing any issue on the site but sometimes it can be as simple as a bad ad slipped through or someone included a URL in the discussion thread that is a problem. If it happens again, send me a private message with the URL of where the issue happened so I can check on it. Cricket, you are the best. Apparently this is a Common Problem OWNED by Google Chrome! We always want more and more things that we think will be of Benefit. In Fact THIS IS GOOGLE CHROME! Does it look “Friendly”? Not to me it doesn’t! I got the Hell out of there as soon as it popped up! Trying to follow the Instructions to “Solve” or DO what Google wants you to do when and if this “Warning” pops up is Unbelievable! There are also a lot of similar ones on the Right Side on YouTube. PS” Whatever happened to K.I.S.S. Cricket: Thanks for your offer but it’s none of those. It’s as explained above (One Up). I think it’s google telling some of us to stay away from carloz. Now the question is, how did you get redirected to that link? Could it be what is commonly called ’Malvertising’? 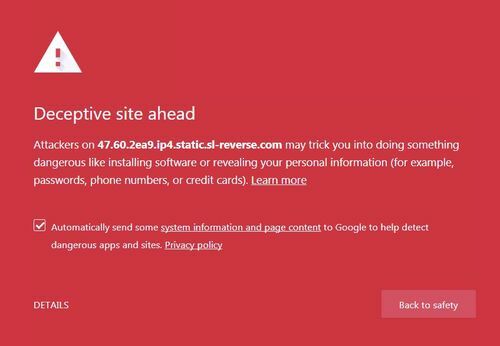 Malicious Advertising can happen when a website uses a rotating type ad service and someone slips in an infected ad and it ends up getting displayed on the website. Malvertising EH? Another New One! Thanks John. Could Be! I just saw a couple of His Posts! Not Very “Delicate”. ..LOL..